On March 21, 2012, Adobe released a beta version of Photoshop CS6. It adds new creative design tools and a redesigned interface with a focus on enhanced performance. CS6 Beta is available for free downloading in English and Japanese for MAC OS X and Windows. New features have been added to the Content-Aware tool such as the Content-Aware Patch and Content-Aware Move. 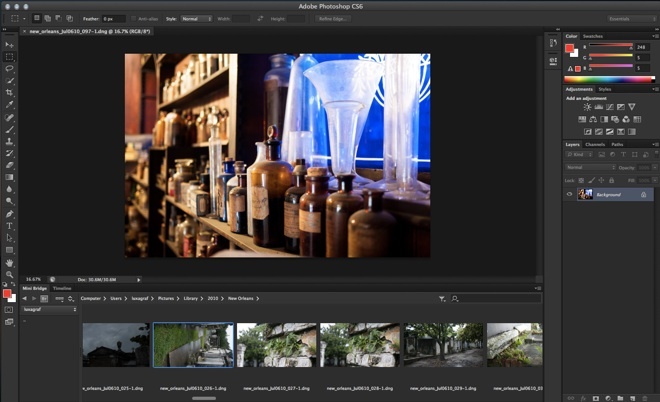 Adobe Photoshop CS6 will also bring a suite of tools for video editing. Color and exposure adjustments, as well as layers are among a few things that will be featured in this new editor. Upon completion of editing, the user will be presented with a handful of options of exporting into a few popular formats. CS6 brings the "straighten" tool to Photoshop, where a user simply draws a line anywhere on an image, and the canvas will reorient itself so that the line drawn becomes horizontal, and adjusts the media accordingly. This was created with the intention that users will draw a line parallel to a plane in the image, and reorient the image to that plane to easier achieve certain perspectives. CS6 will allow background saving, which means that while another document is compiling and archiving itself, it will be possible to simultaneously edit an image. Also, CS6 will also feature a customizable auto-save feature, preventing any work from being lost. All the tools and filters will be improved and optimized in CS6. Now, when a filter is applied, it will be applied to the current layer, as opposed all layers in older version of Adobe Photoshop. Adobe has responded to feedback from the graphic design community, and has modified the User Interface accordingly. Now, it boasts a more unified, static look, and is easier to keep track of all the palettes and documents. Adobe Photoshop CS6 is perfect tool for editing thanks.